Realism had many faces. As an international impulse seen in European and American art, Realism was not so much a style or a look as a new approach to art, overtaking the old ideas of exhausted Romanticism. By the 1840s, due to the impact of science and technology, a more materialistic and positivist approach to philosophy emerged. Idealist philosophy, based upon abstract principles and models gave way to empiricism and pragmatism. Social change accelerated and demanded serious attention from progressive thinkers. In an age of growing discontent over the failures of the Revolutions in France, there was a growing interest in the arts with the problems of contemporary life there was an increasing interest in the arts with the problems of contemporary life. Universal enfranchisement to all citizens was still a dream. 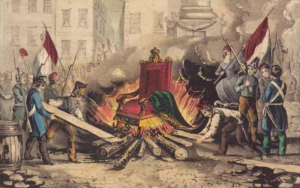 The failure to alleviate the economic imbalance between the classes and to grant political power and rights to the lower classes meant that both France and England were faced with the choice between reform or repression. England would grant reforms to the lower classes by carefully calibrated degrees, staving off serious unrest and outright rebellion. The French, ever wary of the dangerous classes, suffered yet another Revolution in 1848 and went through another political upheaval. This Revolution was eventually brutally suppressed and all hopes of reform were snuffed out when Louis Napoléon, nephew of the Emperor, returned to France and seized power in 1850. When the Nephew crowned himself Emperor Napoléon III, any traces of Romanticism evaporated in the cold water of yet another autocrat on the throne of France. Having an Emperor seemed an anachronism in an increasingly modern France Napoléon III attempted to span the time barrier by favoring commerce and business, supporting an increasingly wealthy and powerful bourgeoisie, the new class. But, in so doing, he was creating a new aristocracy and further dividing France into those who had benefitted from the new economy and those who were being left behind. In order to control and contain the “dangerous classes,” the restless and dissatisfied proletariat in the city of Paris, the new Emperor embarked upon a decades long renewal and modernization of Paris. Long after he had been driven out of office, Napoléon III’s vision of a modern city finally came into being, with its broad boulevards and modern sewer system. Regardless of the intentions of the Emperor, a mixture of ill will towards the poor and an effort to transform a medieval city into a modern city, the modernité of Paris gave rise to a new form of Realism, an urban realism that rivaled the rural realism of Courbet. In addition to philosophical and social forces that ended Romanticism, the rise of Realism was very much linked to the rise of the Middle Class as a major force in society. Napoléon III hollowed out the center of Paris for them, pushing out the unsightly and difficult lower classes and displacing them to the banlieu or the suburbs. As the Paris of Georges Haussmann, who was in charge of the redesign, emerged the power of this class was evident. 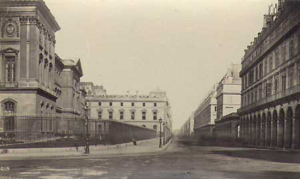 The new broad boulevards were lined with five story buildings expressly designed for the wealthy. By mid-century the bourgeoisie has become the dominant cultural force. Unlike the traditional upper classes, the status of the middle class was based upon wealth and a distinct value system which was based upon social mobility. It was the middle class that divided the genders and subjugated women to the rule of men. For the newly wealthy males, it was important that their wives were shown to be at leisure, like an aristocratic woman, and she became a fashionable bill board for her husband’s wealth. Each man wanted his home to be his castle, and it was important to him to have power over his own family. This new class was not widely read or particularly well-educated, nor was its taste particularly refined, but the bourgeoisie were eager to make its influence felt in the realm of culture. Because it was easy to understand and accessible, the middle class art public preferred the kind of art that was legible or realistic. For the bourgeoisie the mark of artistic talent was not creativity but the ability to copy nature. Artistic experimentation and innovation was not appreciated, and the public shied away from extreme Romanticism and Realism, seeking an art that was more “middle of the road” or juste milieu. The idea of the worth of an artist was, in and of itself, a rather middle class one–the artist had to demonstrate technical ability as a painter or a sculptor. The inference was that the “artist” was a hired hand who had certain skills that should be on display. The transaction between the artist and the bourgeoisie was an economic one, one well-executed object exchanged for a handsome sum to be displayed in the new Haussmann designed town house. As the result of the insistence on technical skills in painting demonstrated in “academic art,” the mid-century art public was trained to appreciate approved Salon art and looked for precise delineation and entertaining stories. But, like any dominant class, the bourgeoisie wanted to see themselves reflected in art. Greek and Roman scenes might be exciting and full of beguiling female nudes, but the audience could not recognize itself in the history paintings. As an artist knows, it is important for the audience to imaginatively and emotionally invest in the art. The viewer must identify with the painting or the sculpture for the work to be successful. Being remote in time, the art dictated by the Academy was not in tune with the modern age and was ultimately unresponsive to middle class needs. The preferred art of the Academy referred back to the classical past of Greece and Rome and only a well-read person could grasp all the classical illusions. Therefore the middle class audience gravitated to realism on two levels. First, people liked to see genre scenes of ordinary everyday life, preferably with an interesting narrative. These scenes should be recognizable and pleasant. Rosa Bonheur was probably the most popular artist in France in the 1850s and 1860s and her subject matter was the animals of France, the oxen in the fields, the horses at the fairs, magnificently painted and totally without controversy. Second, the average spectator preferred realism over expressionism in terms of how the artist should render the subject. The audience was not interested in personal expression and preferred to be shown a realist rendition or recreation of an interesting scene. For the Salon audience, art was the nineteenth century equivalent to a popular movie–well executed and entertaining. Another important factor in the rise of Realism was the invention of photography in 1839. 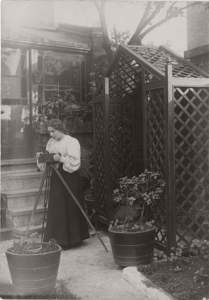 Photography was a hugely popular art form and the public avidly flocked to photographic studios to have themselves immortalized. Photography was, of course, an accurate mirror of nature, an exact copy. The public liked the precision of the daguerreotype better than the fuzzy surface of paper photography and began to expect the artist to live up the process of Dauguerre. Artists were at the mercy of this new public and had the choice to comply with its demands or to drift into the avant-garde where another type of Realism was being developed. Here, on the fringes with Courbet, the artists would find failure while they waited for a rare success. The artists who wanted to succeed steered a middle course between Romanticism and Realism and between academic art and photography. The result was a form of art, called juste milieu, that was both popular and official. Early on, juste milieu art, fulfilled the need of the growing middle class audience for a popular art and for subject matter that was about them and their lives and that was easy to understand. This art was “easy,” rather like today’s television: realistic and entertaining and enjoyable, giving the audience what philosopher, Roland Barthes called “the effect of the real.” The juste milieu artists were successful and rich and respected and were often the implacable foes of the avant-garde. They found the right formula to please audiences. The subject matter really wasn’t “modern” or about the current age. Indeed, given the current political climate in France, the juste milieu artists tended towards the historical escapism of Jean-Léon Gérome or idealized depictions of the countryside and its inhabitants from Jules Breton. The middle class favored landscape painting, once considered a “low” genre of art. In an age of social turmoil a scene of unscathed countryside or untouched forests were soothing and non-political. And landscape painting was well suited to middle class needs for interior decoration: it was pretty to look at and avoided any unsuitable or controversial content. The size of painting began to change. The successful artist was well advised to divide his or her time between the large paintings, destined for the Salon, and smaller works, designed for the bourgeois home. Sculpture suffered during the waning of classicism and academic art. Like history painting, classical sculpture was not well-suited to the modern era and sculptors struggled to translate contemporary life into bronze and marble. Like the painters, the sculptors had to divide their endeavors between large-scale public commissions and small scale works, destined for the private market. It is important to understand how the juste milieu artists approached their subject matter. Paul Delaroche, Jean-Léon Gérome and Ernst Meissonier were all respected and wealthy painters by the 1860s, and they rejected the tradition of academic history painting. However, these artists were painters of history, but, for many of them, their content was contemporary or the near and national past. Gérome was particularly successful with a new art form: the historical genre painting or scenes of everyday life from distant and exotic lands, especially the Near East. 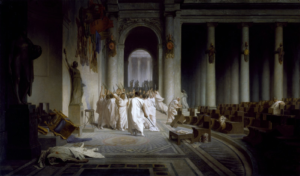 The art public enjoyed Gérome’s depictions of ancient Romans living in a way that seemed to resemble their own lives.But Gérome also gave the audience thrilling scenes from the past, such as the assassination of Julius Caesar and gladiatorial contests in the Colosseum. To today’s viewer, Gérome’s paintings are eerily like a Hollywood production, and, indeed, Gérome was typical of his time in his rigorous attention to historical detail and accuracy. In addition, Gérome’s exotic excursions into the Middle East were expressions of France’s burgeoning empire building across the Mediterranean on the northern coast of Africa. Paul Delaroche is famous in the history of photography because he greeted the invention of photography with the cry, “From today, painting is dead!” Delaroche actually mentored many painters who became photographers and his work, like that of Gérome had that intense realism that resembles the high gloss of a movie. Delaroche is best known for his dramatic scene of the beheading of Lady Jane Grey in 1833. As might be expected, beheading was a sensitive topic in France, and many art historians have suggested that Delaroche’s painting allowed the public to consider the execution of a ruler from a distance of time. The painting is well-executed (no pun intended), as are all the works of the juste milieu artists, and dramatically effecting in the heart rending depiction of the last moments of the Nine Day Queen. Ernst Meissonier was also a history painter, but his works were about French history and small in size. His popular specialty was scenes of the first Emperor, Napoléon, around whom a cult of nostalgia had formed. A contemporary of the Realist painter of peasants, the unpopular, Jean-François Millet, Meissonier was one of the most successful and respected history painters of his time. Renowned for adherence to accuracy—he even owned one of the Emperor’s saddles—-won him the adulation of the art public and the scorn or the avant-garde critics. By the end of the Nineteenth Century, the art world had split into opposing segments, the conservative, the juste milieu, and the avant-garde—all of which had a stake in Realism. Avant-garde Realism, which is covered in another chapter, did not use a realistic style to make history look “real,” instead the Realism of Gustave Courbet and Jean-François Millet was contemporary, of its own time, and provocative.